Sea snakes typically grow up to 5 feet in length, but some of them can reach as much as 9 feet long. They are hunters that eat eels and fish, but they’ll also make a meal of any fish eggs they find. These swimming reptiles are abundant in parts of both the Indian and the Pacific Oceans. Most of them stick close to home, but some venture out into open waters. 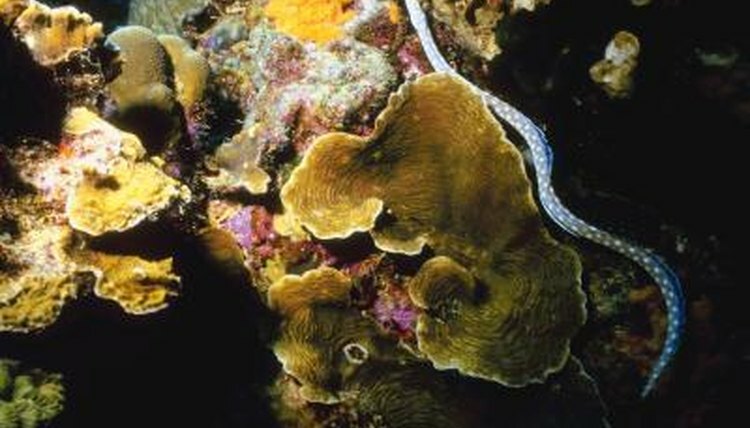 Most sea snakes like warm, tropical waters and tend to avoid areas with colder temperatures. They also typically prefer to stay in shallow water, no more than 100 feet deep, since they are air breathers who dive to the bottom to feed on the small fish that live there. These habits tend to keep sea snakes close to the coastline and around coral formations such as the Great Barrier Reef, and most of them are not known to migrate to other areas for any reason. One type of sea snake is an exception to the rule and can be found throughout the ocean is the Pelamis platurus, commonly called the yellow-bellied sea snake. They spend their time swimming freely in the ocean, typically far from shore, though the wind and currents may push them toward land. These snakes are sometimes found in the waters around Hawaii, Guam and the Philippines. The yellow-bellied sea snake often swims alone, but sometimes he may get together with others of his kind as he seeks food or a mate. These snakes aren't technically migrating, but rather following ocean currents. Yellow-bellied sea snakes have been observed in parts of the ocean known as drift lines. These are places where different currents in the ocean converge. Drift lines are visible as exceptionally quiet sections of the ocean that collect all manner of debris. The sea snakes migrate there and live within the drift lines, hunting the fish and eels that are also attracted to these spots. Along the coastline of Central America it’s common for hundreds of yellow-bellied sea snakes to congregate in the drift lines. The type of sea snakes known as sea kraits can move on the ground and seek out of the ocean to lay their eggs, but there’s no big migration of them at any one point in time. Most other types of sea snakes reproduce while swimming in the ocean, giving birth to live young in their home territories. Yellow-bellied sea snakes behave a bit differently and migrate to rocky shores and mangrove swamps to breed and have their young, usually giving birth to one to eight babies at a time. How Far Do Green Sea Turtles Go to Lay Eggs?